On June. 12 – 14 of 2013, representatives from both Canadian suppliers and distributors, came together to talk about the industry and its changing landscapes. This is known as the ASI Power Summit. Discussions from product trends, to new marketing techniques, diverse topics were shared amongst all to educate and inform. During this years Power Summit, the fastest-growing Canadian companies within the promotional products industry was announced. 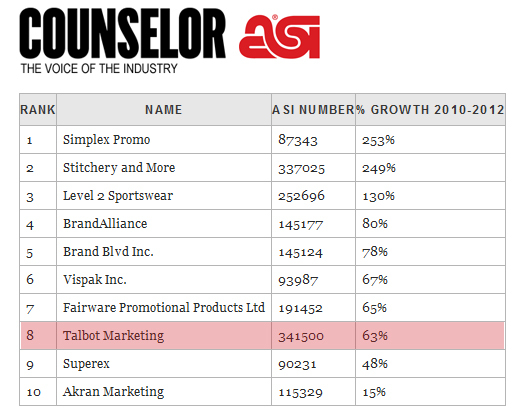 Making its way on the list, Talbot has been placed 8th with a 63% increase from 2010 – 2012! Steve Levschuk, President of Talbot talks about the growth of the company as well as the industry. Click on the button below to watch the interview!